In September of 1773, Daniel Boone led a party of hunters on their very first attempt to settle Kentucky. Running low on supplies, he sent his son, James, and others back home to Washington County, Virginia for more. James gathered all the supplies he needed. He also picked up a passenger, 16-year-old Isaac Crabtree, who hailed from a family of longhunters and who wanted to be a part of the expedition. On his way back to his father, James decided to camp for the night at Wallens Creek. Little did he know he was only two miles from his father's camp. As dawn approached the following morning, the 10th of October, a party of indians attacked James and his party. Everyone was killed, except for a slave and Isaac, who had been hit in the back by an arrow, but managed to flee into the woods away from the massacre. Wounded, cold and hungry, Isaac wandered aimlessly for days before eventually finding his way back home in Washington County. The incident haunted him for months, and his hatred for indians increased. It also caused Daniel Boone and his party to abandon their first attempt to settle Kentucky. The following spring, a festival was held in Jonesboro, Tennessee, where a peace treaty with the Cherokee's was to be signed. Isaac attended the event, but while there saw what he thought was one of the assailants from the massacre. Without hesitation, he drew his weapon and shot and killed the indian. As it turned out, the man he shot was the nephew of one of the chiefs. The shooting jeopardized the signing of the peace treaty for a while and almost caused a war with the peaceful indians. To say the least, everyone was upset at Isaac. As a matter of fact, the Governor of Virginia went as far as to offer a $50 reward for his arrest. In July of 1774, Isaac stood trial for the killing, but he was not convicted. Isaac continued his life as a longhunter in the hills of Virginia and Tennessee. At the age of 41, Isaac Crabtree finally made it to Kentucky, when he migrated west to near the place I often write about...Stockton's Valley. He owned land on Bear Creek and Sulphur Creek in present day Cumberland County. He also owned land in Elk Spring community in present-day Wayne County. He also owned property on Furnace Mountain, located just outside of Monticello, where he lived. Isaac became one of the first Trustee's of Monticello and helped in laying out the town. In 1806, he was elected to the Kentucky State Legislature as a Representative from Wayne County. Later, Isaac moved to Overton County, but in 1839, at the age of 82, Isaac returned to Kentucky, where he lived out the rest of his days near Poplar Mountain near the Clinton-Wayne County line. Isaac Crabtree is the 5th great-grandfather of my cousin on my daddy's side, Marie Bush. Isaac is my 6th Great Grandfather. Isaac Crabtree is also my 6th Great Grandfather! I expect, Jim, that makes us cousins! I love this Blog. Please Notorious Meddler keep it coming. Your stories are marvelous. To be a writer, I know you do a lot of research. I am also related to a Isaac. His son Squire was the father of Solomon Crabtree who married his cousin Chloe. Solomon was born in 1815. Many of us have been trying to prove that Squire was the father of Solomon. Do you have any information about this matter? Solomon was born in 1815. All three of the men were in Overton County, TN at one time. Where is this highway sign located? 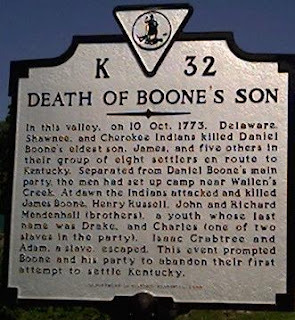 Boone's death strongly contributed to the Indian uprising known as Lord Dunmore's War (May to October 1774). It affected an area from Virginia to Pittsburgh, PA.
My grandfather, Frederick Crabtree, always told us we were related to this Crabtree who assisted Daniel Boone. My grandfather was born around 1914 in the Raleigh Durham area of North Carolina. Coincidentally, I named my son Isaac. I think you and I are related. Issac was my 6th great uncle. Let me know if you would like to have my email. Isaac Crabtree is my 4X great grandfather. My paternal great grandmother was a Crabtree - Isaac's great granddaughter. Isaac is my 5th Great Grandfather. Oh how I wish this information was so easily available 10 years ago while my father Ralph was alive. I'd love to listen and share with him.My Grandma Maggie Moore's Grandfather was Christopher Columbus Crabtree son of Mark and Susan New Crabtree. Mark Crabtree was the son of Job and Mary Fuller Crabtree. Job was the son of Isaac and Sally (Elizabeth) Pike Crabtree. I have an awesome cousin who will be sharing more information this summer and I am so excited to start visiting some of the cities. Hi Rachelle. Thanks for writing. We have to write these stories for our children and these children. People like Isaac Crabtree need to be remembered. This is one of my most-read stories. Isaac Crabtree is also my 4x's great grandfather on my father's side, through Rebecca. I wish my Dad was still alive to hear the story. I'm sharing our history with our Grandson and making sure my children know our PROUD history. Glad to know the location, it's on my bucket list. Hi Wendy! I write for the same reason. We have to pass our history and more importantly, our heritage, down to our children and beyond.